The Connect is our standard projection screen within the Euroscreen’s® range. 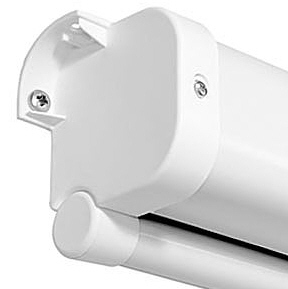 This white steel case is very easy to install both directly onto the wall or the ceiling, and optional mounting brackets allow for keystone correction if needed. The Connect has recently been upgraded and is today equipped with a bottom dowel incorporating a new smarter looking bottom bar and end cap. The Connect cases is available both as manual or electric screens, and the electric models have as standard the Plug n’ Play function. The Connect is offered in our matt white Arctiq screen fabric, and is available in no less than four different picture formats. 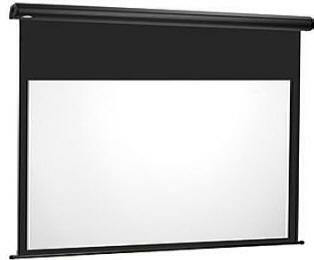 With the BlackLine we offer a black case with black edges surrounding the viewing area, either in video (4:3), widescreen (16:9) or cinemascope (2.35:1) format. 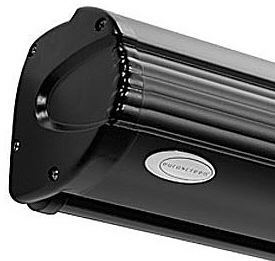 The BlackLine is a black version of the Diplomat and has the same versatile and upgraded qualities as the Diplomat. The BlackLine has the Plug n’ Play features as standard. The BlackLine is especially popular for home theatres and a perfect choice since the case and the black framework works together with the projected image. We strongly recommend the BlackLine with one of our high contrast materials as your choice for home theatre use. This will produce more vivid colours and greater contrast in the image. For a complete home theatre feeling we also recommend Commander Control System™ for a total control over screen, projector and lights. Excello 2000 is a modern version of a rail system used for many years. This projection screen solution is mainly used in education environments and it allows you to attach screens, maps and posters in a very flexible way thanks to special carriers. The brackets used on the rail system are also widely used for installations of projection screens with overhead projectors. The entire rail system is easy to install.